CrossFit has developed a loyal following of fitness enthusiasts. An often-cited benefit of CrossFIt is that it develops functional fitness skills, meaning that what you learn to do in CrossFit (e.g. lift weights) helps you perform better in everyday life (e.g. lifting boxes when you clean your garage). However, CrossFit seems to miss the mark on training a very important yet rarely-discussed component of the core – the pelvic floor. Realistically, most fitness regimens don’t address the pelvic floor. Most people think only of the abdominals when someone refers to their “core”. But the core is actually a cylinder of muscles that includes the pelvic floor. The abdominals make up the front of the cylinder, the deep back muscles are the back of the cylinder, the top of the cylinder is the respiratory diaphragm, and the bottom is the pelvic floor. See this video of Amy Flory, PT, giving a short explanation of this concept HERE. 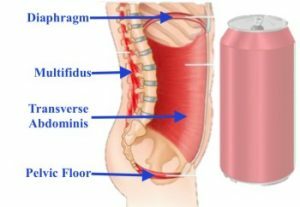 Because this cylinder is pressurized, it is often compared to a soda can (see diagram). So think about this: if the inside of the cylinder is pressurized (what we would call intra-abdominal pressure) and the only way out is through the pelvic floor, what is likely to happen in instances of increased intra-abdominal pressure, such as when we lift heavy objects? That’s right. Urine leakage, or what we would technically refer to as stress incontinence (not psychological stress, but mechanical stress). Sometimes, that increased pressure can also result in dropping or bulging of the pelvic organs. And here’s the thing: stress incontinence should not happen, even when you’re setting a new personal record in the power clean! The pelvic floor muscles are skeletal muscles, meaning that they can be trained and strengthened like your quads or biceps. You just have to learn how to contract them (think Kegels) and get in the habit of engaging them when you’re lifting or jumping. For help on training your pelvic floor muscles and reducing long-term tissue damage that result in stress incontinence and pelvic organ prolapse, make an appointment with a pelvic floor physical therapist. There are two of them at CoreBalance: Amy Flory, PT, and Colleen Gest, PT. If you live outside of northern Arizona, they can help you find a specialist close to you as well!